And then led me to decide to include a note from me for them as well. Have my current students write a letter to their future selves before they leave my class at the end of the month. Have them seal the letter in an envelope and put a sticker on it so they know I didn't mess with it. Ask students to write their home addresses on a sticky note that I can attach to their letters. Save these letters until a future date, possibly January 2017, to send out. 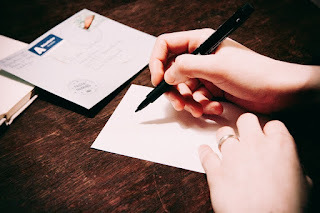 Send their letters to their homes, in a larger envelope with a short note from me. Doesn't that sound awesome? I am so excited for this idea it is making want to write the letters today, except school is now over and it's the weekend. I guess I better put it in my plan book for next week. My only fear for this project is the fact that I might lose the letters, so I better put them somewhere safe! How about you folks, do you ever do anything like this? Do you ever have your students write letters to their future selves? How did it go? What was the most difficult part?